The other morning, I found this Eastern Box Turtle crossing the driveway in front of my house. I hung around and watched as it made its way across the drive and on into the tall grass near the upper end of the pond. 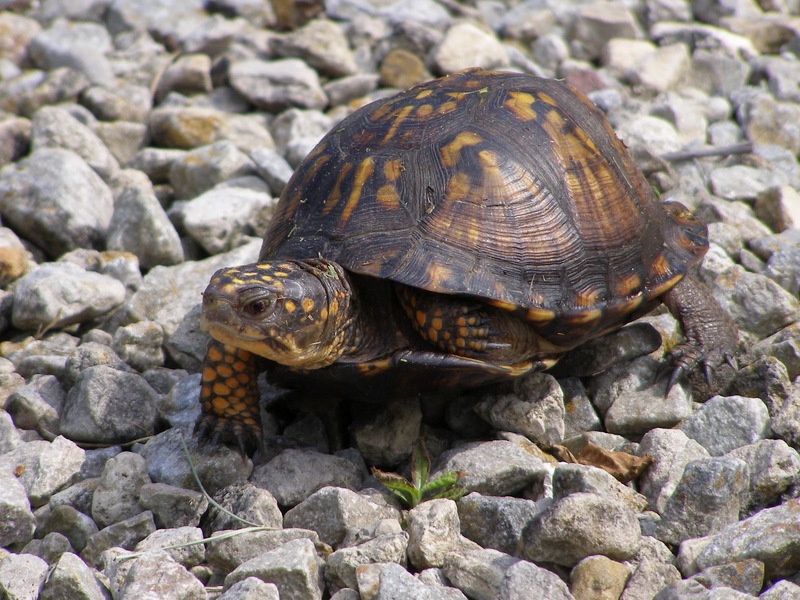 Several years ago, I was standing near some bushes at the edge of the lawn, watching a turtle travel an almost identical path. Someone skidded their car to a stop at the end of the drive, got out and hurried towards the turtle. They never saw me and were quite startled when I was suddenly between them and the turtle. Their mistake cost them a lecture in which I imparted my thoughts on wildlife conservation, trespassers, poachers, thieves and idiots. I don’t know if their day improved from that point on, but I doubt it got any worse. You’re liable to find turtles any time from spring through fall, but there are two weather events that are guaranteed to make them increase their activity. One is rain. 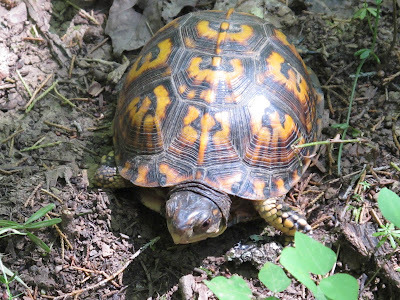 Rain brings out the worms and slugs and the turtles go in search of these juicy morsels. Two is drought. 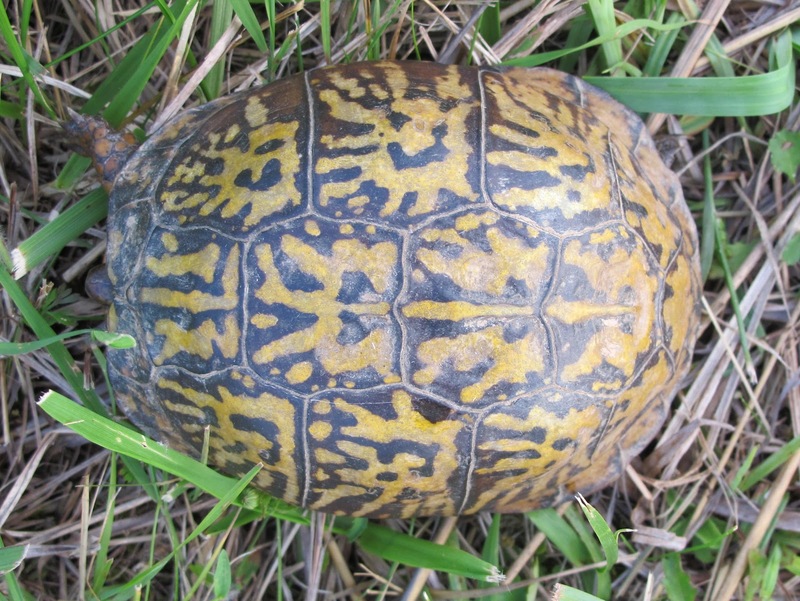 Turtles change their patterns to utilize available water sources. 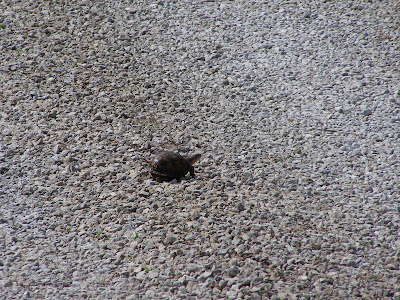 When a drought comes on suddenly, like the one we’re experiencing right now, the turtles all seem to shift at once. 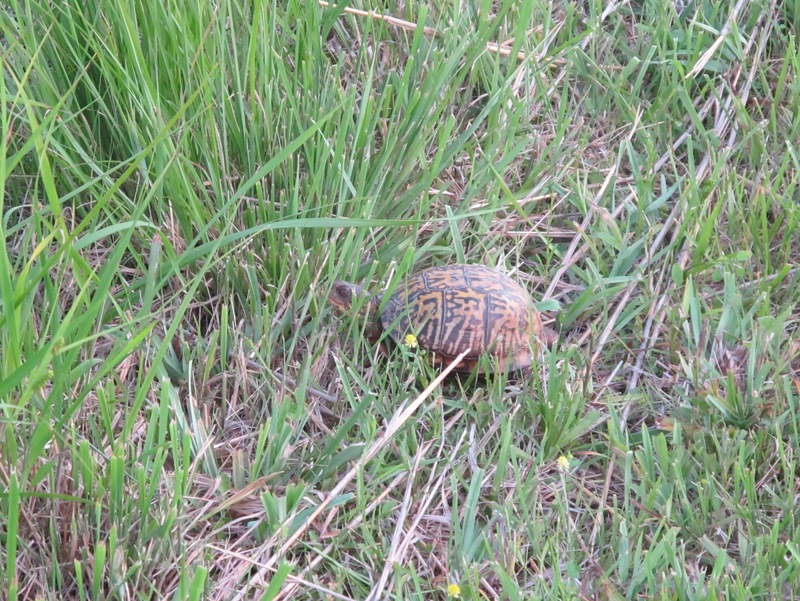 On a recent hour long walk, I found six different turtles. 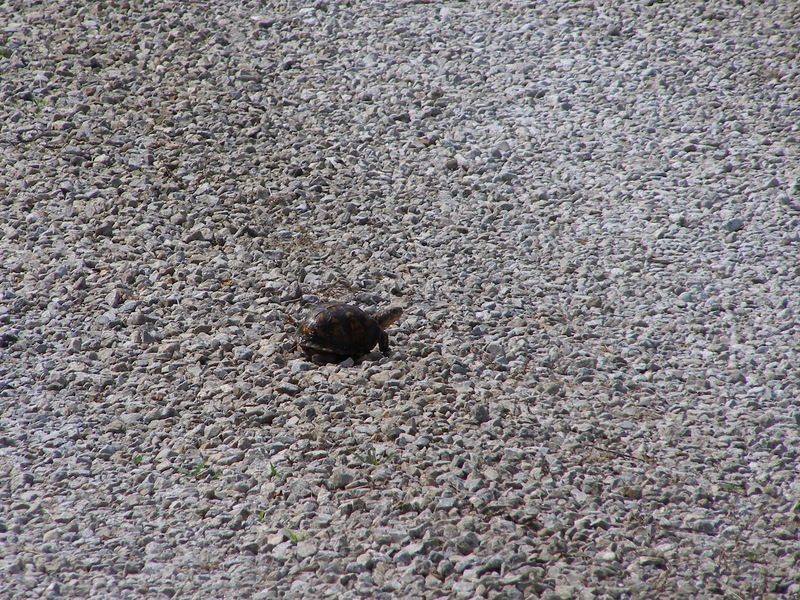 As the turtle from the driveway made its way to the pond, this turtle was already finding the pond waterless. Several different turtles visit the pond. It’s a common sight to see one of them crossing the yard on the way to the water. This youngster was traveling across the dry floodplain near the creek. Its line of travel would take it to one of the few remaining pools. 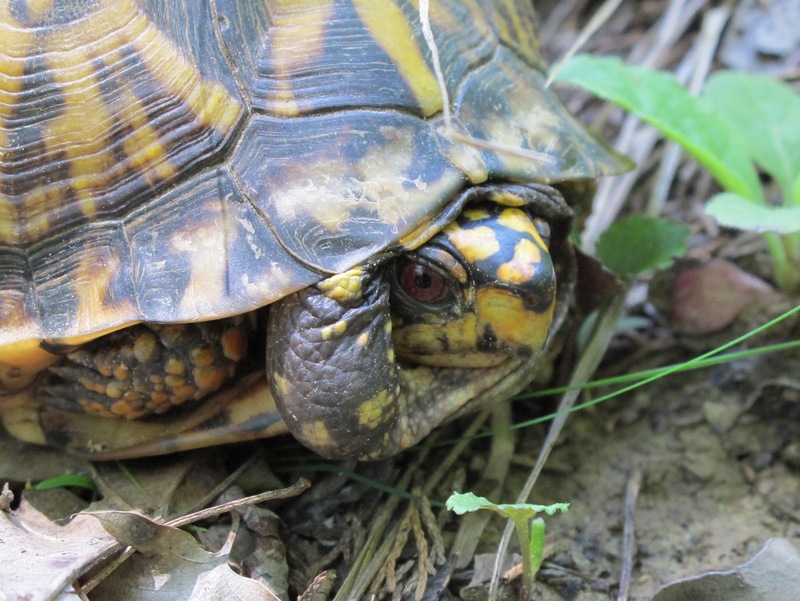 Farther down the creek, I found this guy with a lump in his neck. He was walking when I first caught sight of him. I was approaching head on and he pulled himself in as soon as he saw me. By the way the skin is folded; I would guess that the lump was down the neck away from the head. 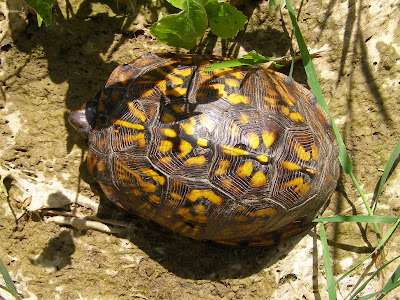 The turtle was active, alert and appeared in fine health. The lump didn’t seem to be causing it any trouble. Still farther downstream was another fine specimen. The turtles don’t spend a lot of time in the creek channel, but I’ve often seen them drinking from the pools. I hope their instinctual behavior is honed enough to keep them from all getting carried downstream in the event of a drought buster flood. Not all of the turtles were near water. This guy was walking across a mowed trail at the top of the hill. 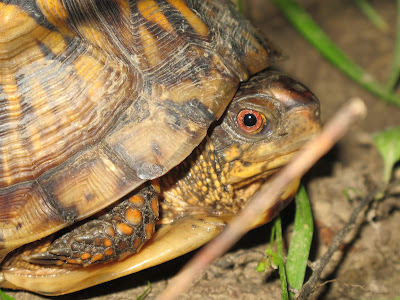 Slugs are still active in the early morning and box turtles love to eat slugs. 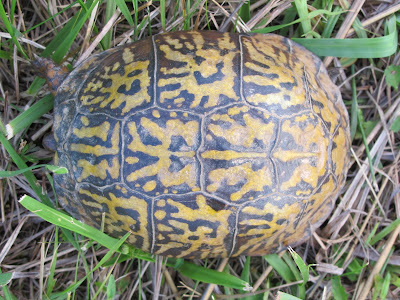 A slug body would certainly hold a good deal of moisture which would help meet the turtle’s water needs. I thought this to be a particularly intricate shell pattern. 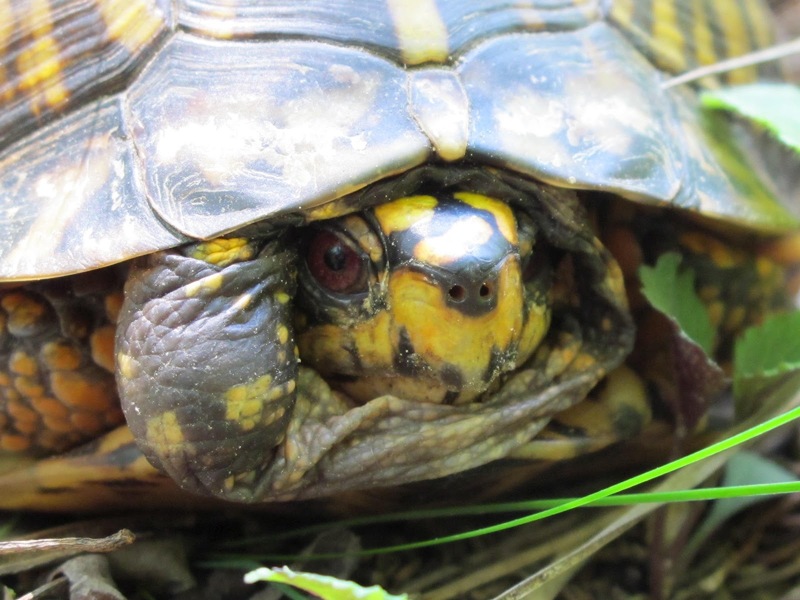 The turtles of Blue Jay Barrens have suffered through many droughts during the past 27 years. They always seem to survive. July is typically a good rain producing month, so there’s a chance of us picking up a few storms that will at least bring some relief to the situation. Until then, the turtles will position themselves to best advantage in relation to available water. 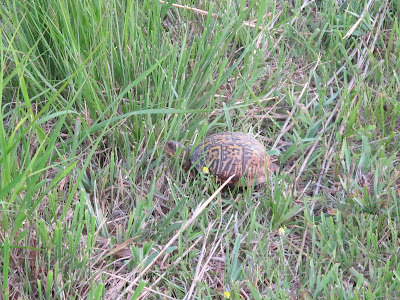 Hopefully I’ll have many more turtle encounters through the summer. 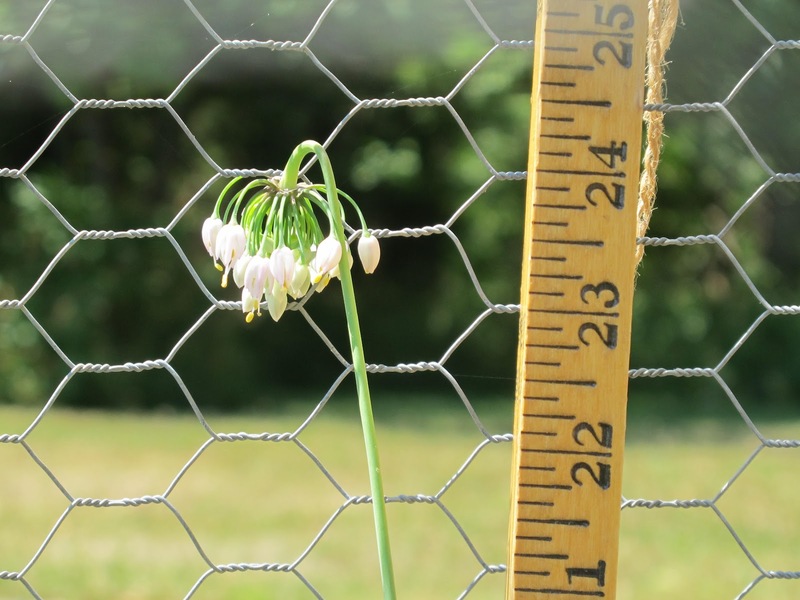 My ongoing project to expand the Nodding Wild Onion population at Blue Jay Barrens is continuing with some signs of success. I wrote about this project two years ago and am happy to report that things have improved since then. 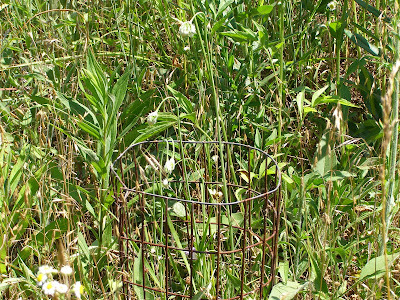 If I can get through this year without disaster, there should be some excess seed to return to the wild. Using some of the little bit of seed I’ve managed to produce, I was able to grow a few healthy plants in this large pot. 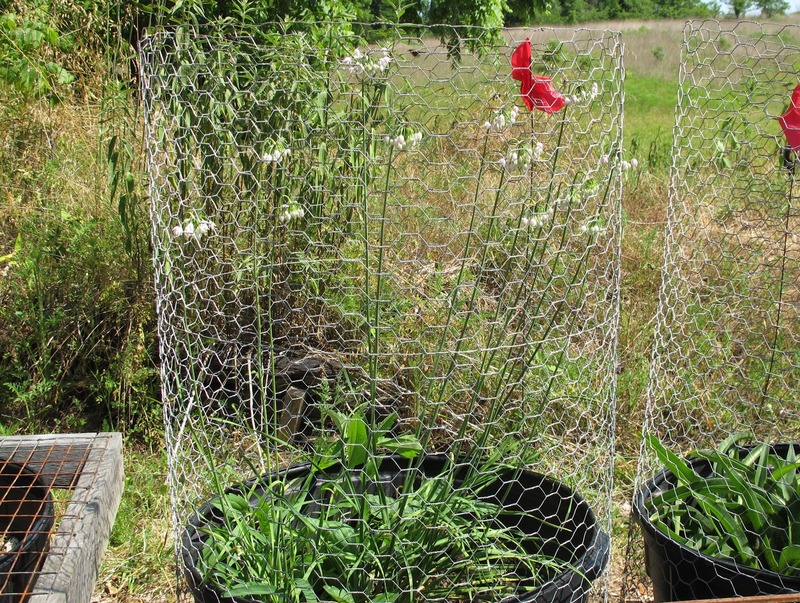 During their two years of growth, these plants have been attacked by Chipmunks, Squirrels, Skunks, Deer, Wild Turkey and Cottontails. 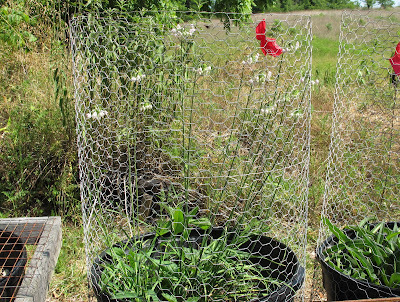 A chicken wire enclosure has greatly reduced the number of assaults. 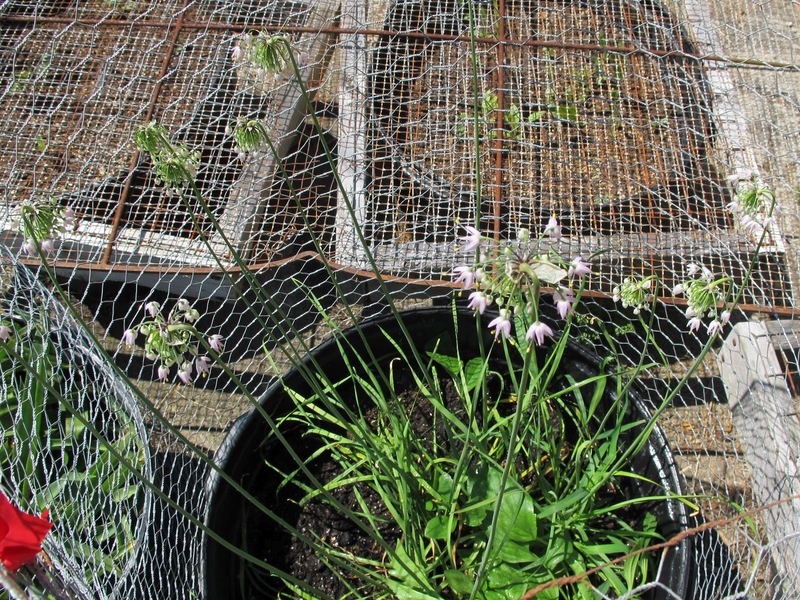 Most of the animals were not interested in the onion plants. They just wanted to dig in the pots. 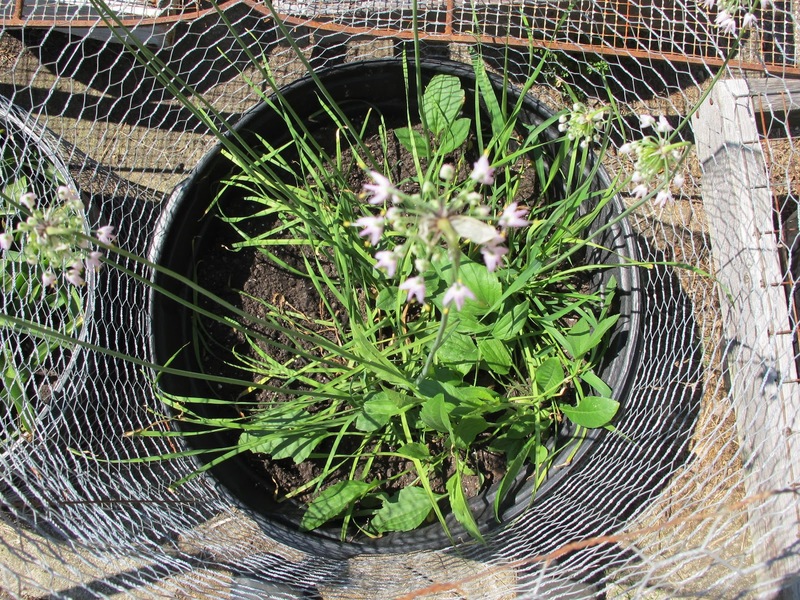 The moist, high quality soil in the pot was just perfect for hunting grubs or making a nest or burying sunflower seeds. 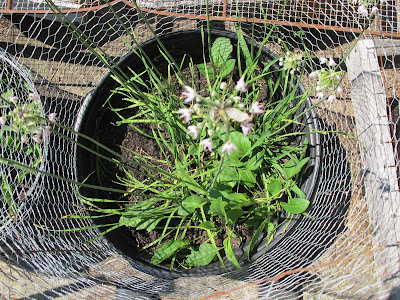 Fortunately the excavations didn’t uproot any of the plants. These onions are benefiting by growing conditions that are better than anywhere else at Blue Jay Barrens. 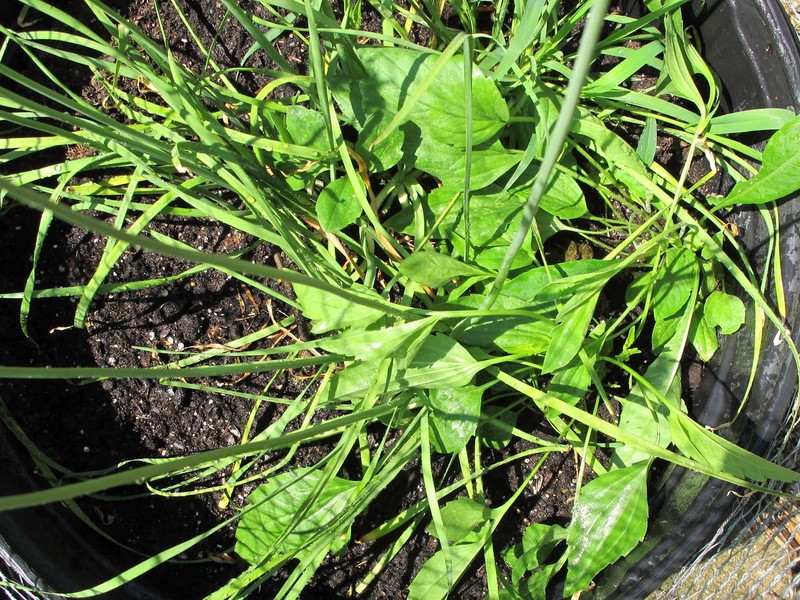 The soil is a compost-sand mix and water is freely applied. The onions, along with a couple of volunteer prairie plants, grow better than they ever would on their own. I’m not sure of the plant count in the pot. 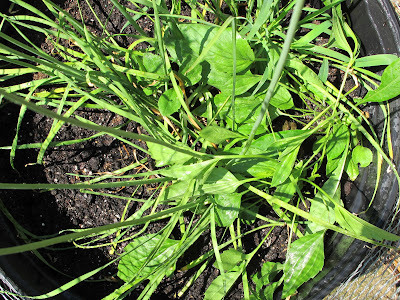 The leaves come from three distinct clumps and a total of 14 flower stalks have emerged. 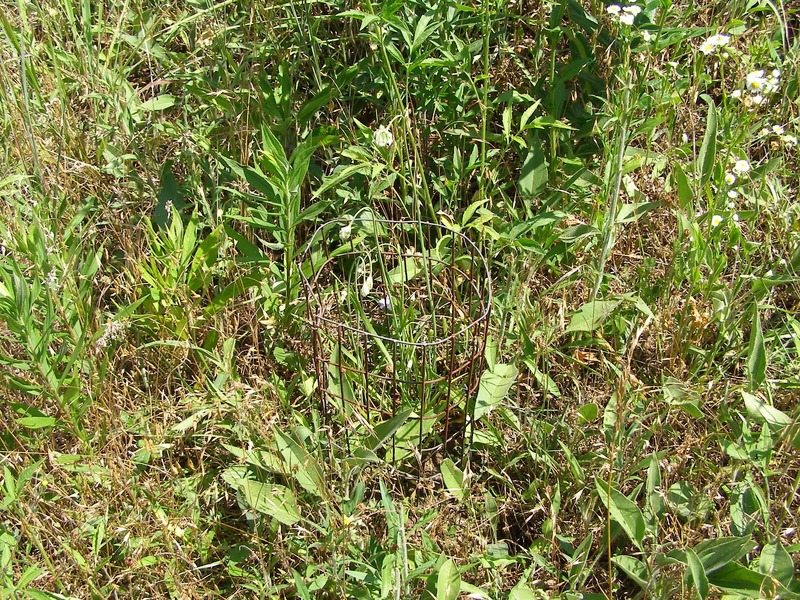 Each flower stalk has risen to an impressive 24 inch height. 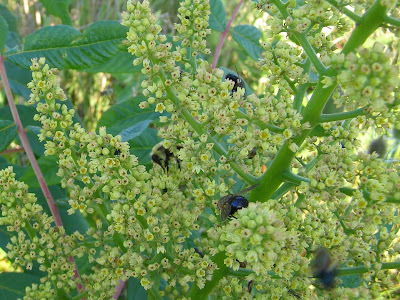 Now it’s just a matter of seeing that the flowers get pollinated. Bumblebees commonly visit Nodding Wild Onion flowers, but the big bees seem deterred by the chicken wire barrier. I may just go ahead and have at it with the pollination brush just to be safe. 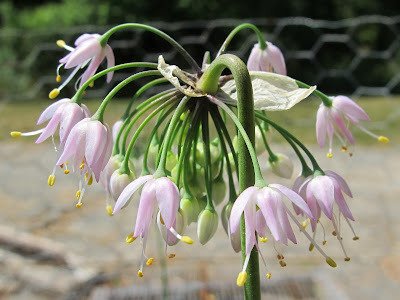 The Prairie Garden population of onions has produced five flower stalks. 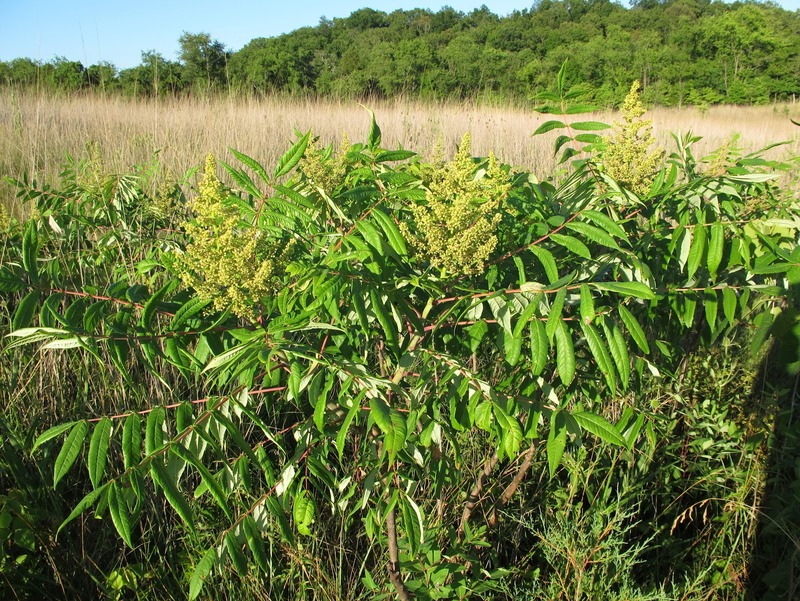 Except for occasional waterings, these plants grow under more natural conditions. Nodding Wild Onions are not endangered, rare or uncommon, except at Blue Jay Barrens. I could easily purchase enough onion seed to blanket the entire property. My decision not to bring in any plant material from outside sources comes solely from my personal idea of how the property should be managed. 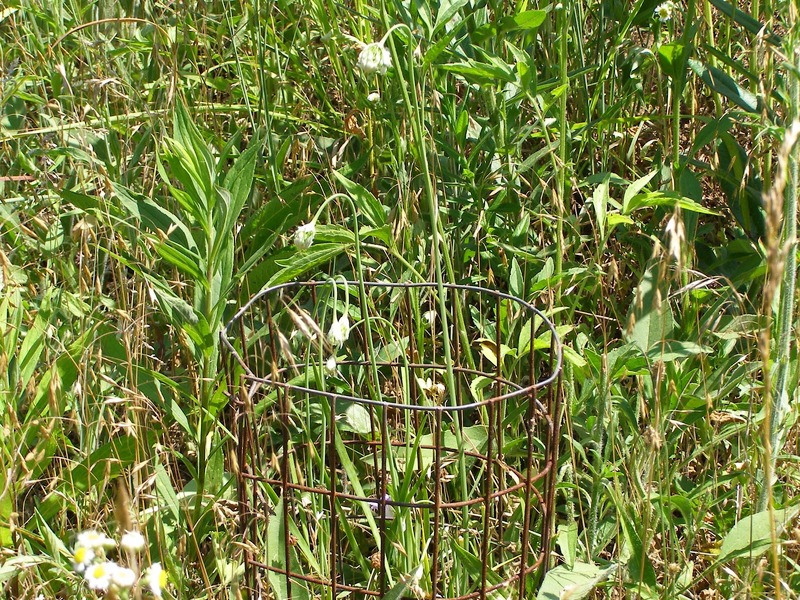 As far as I know, the native plant population currently found here is from naturally occurring species that historically survived on this property. It’s those plants that I would like to see thrive. Happily I don’t have to answer to any Boards, Committees, Supervisors or Public Opinion. My management decisions are implemented without argument. There are certainly some wonderful perks associated with managing your own property. Smooth Sumac, Rhus glabra, is just beginning to bloom. 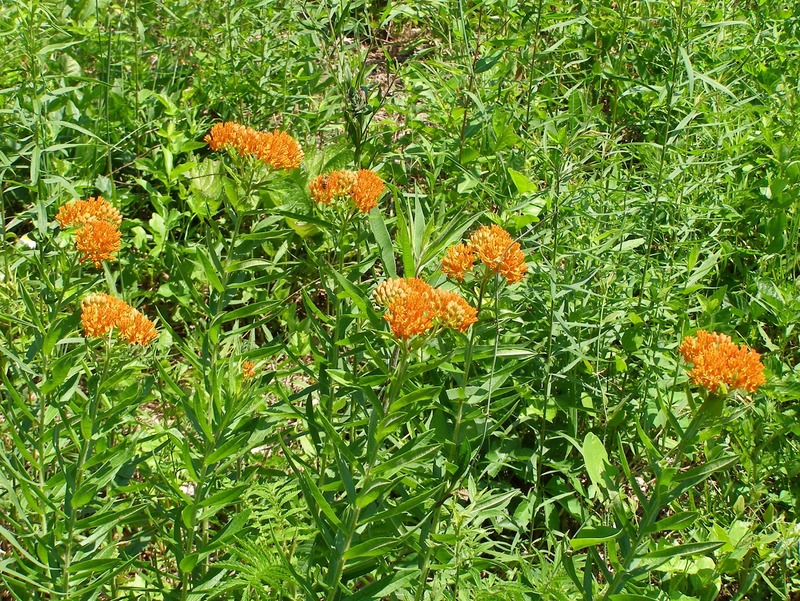 I have an abundance of this plant along the trail leading up the hill behind the house. 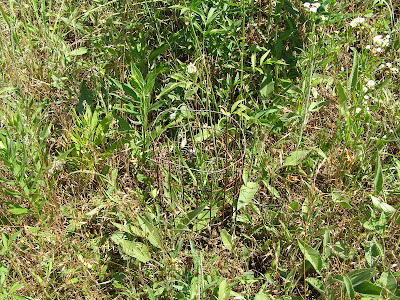 It gets mowed about every three years and blooms heavily the second year after mowing. The result is a massive display of blooms at just about eye level. It’s just perfect for viewing visiting insects. A flower head forms at the end of each branch. 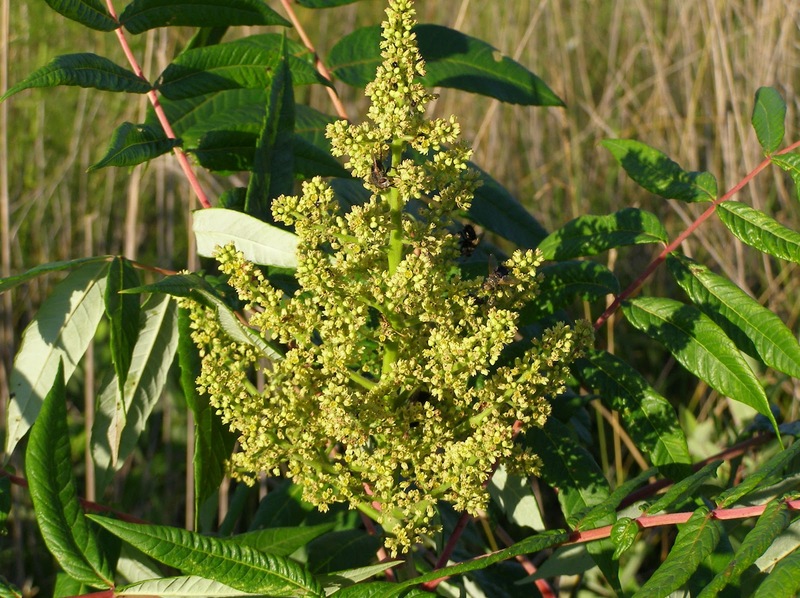 Smooth Sumac is a common species that is recognized by its hairless stems. The buzz of nectar eaters never ceases. Bees, wasps, flies and beetles are frequent visitors of these flowers. Hairstreak butterflies also make use of this nectar, but I have yet to see any of the hairstreak species this year. Tachinid Flies were the noisiest of the various visitors. Tachinids come in a variety of sizes and colors, but my preference is for these large types. Tachinid larvae develop inside a living host, usually a specific insect species. The adult flies are so numerous it’s almost impossible not to see them when you’re in the field. 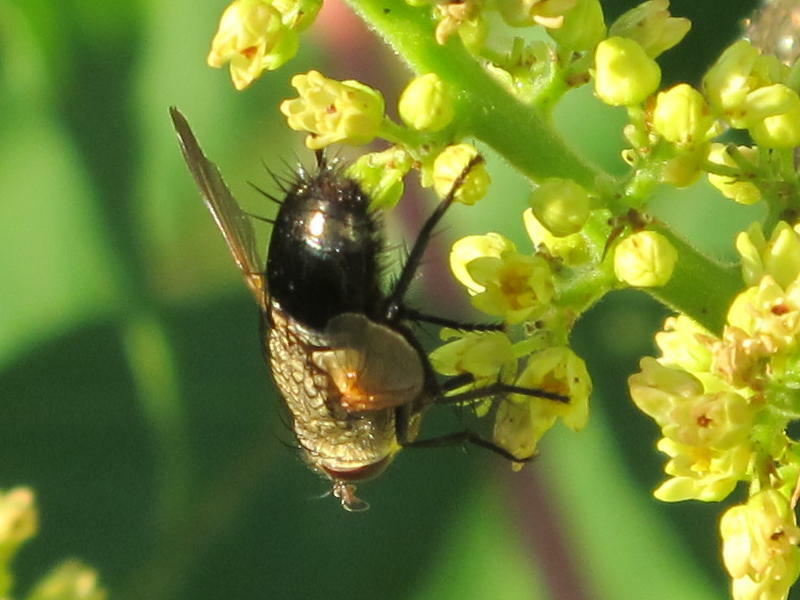 Despite seeing thousands of adults, I’ve never seen a host insect containing a Tachinid larva. This is a Yellow-collared Scape Moth. I see this day flier on many different flower species that produce large flower heads. 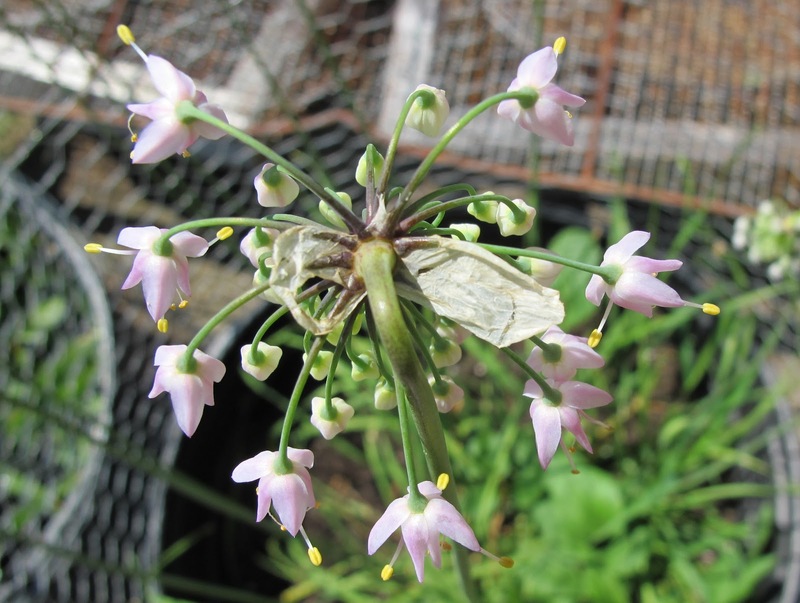 The moth tends to take advantage of the flower cluster to partially hide itself while feeding. 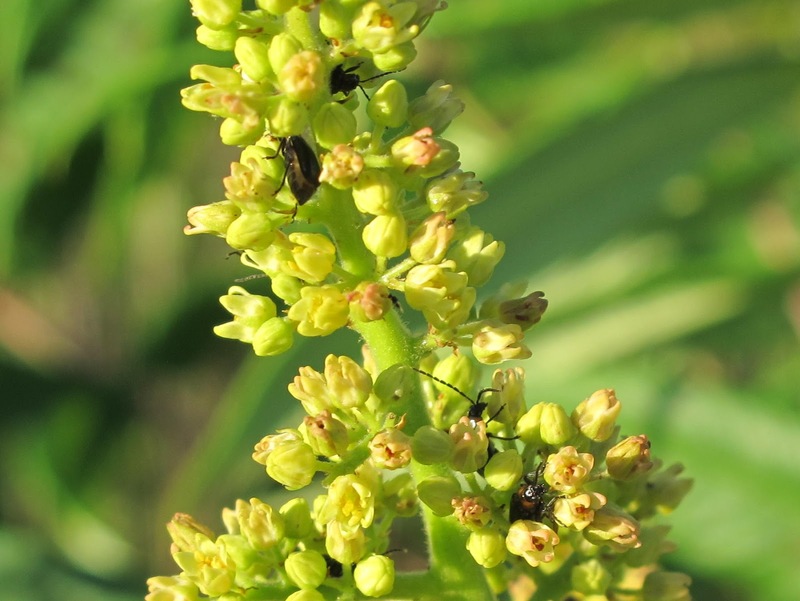 Beetles abound in the flower cluster. Most try to remain hidden among the small flowers. 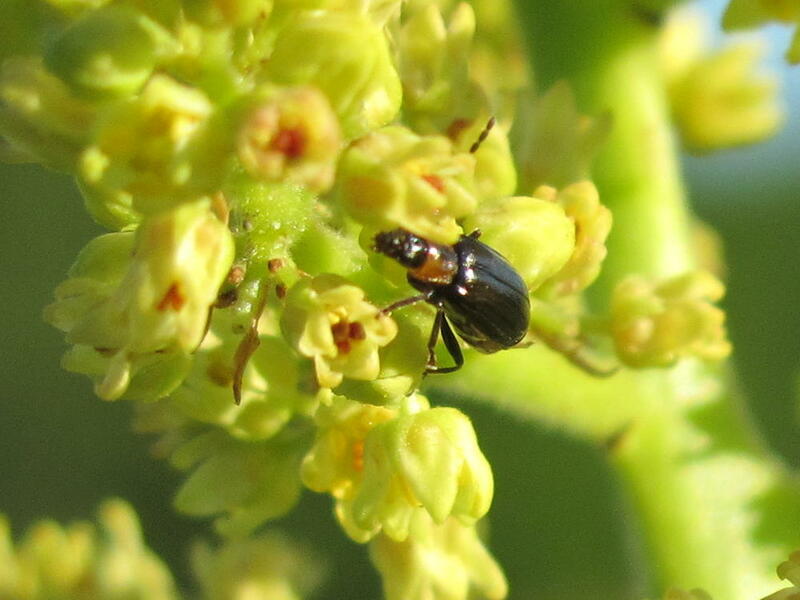 I think this is some type of Soft Winged Flower Beetle. I couldn’t tell if it was actually feeding inside the flower or searching for something on the outside. 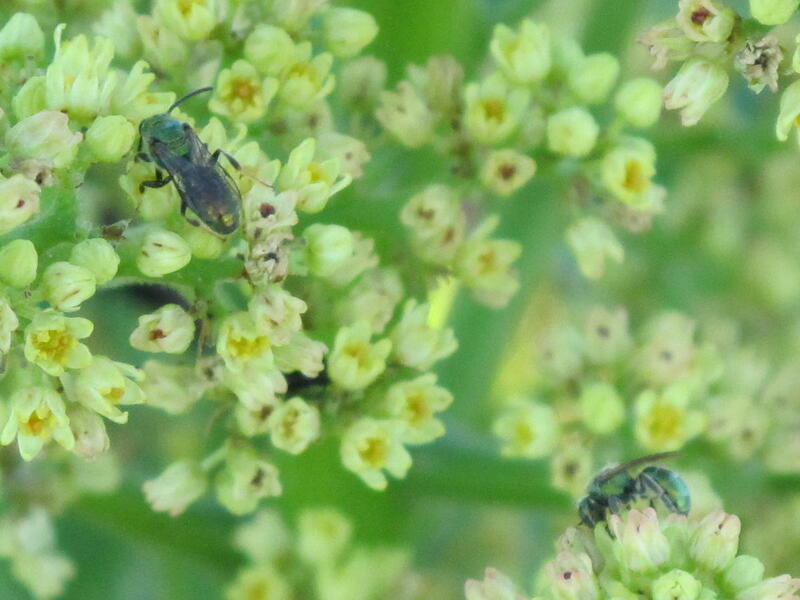 Of course the little green bees were there. I have yet to find a flower that doesn’t attract these bees. I think sumacs are one of the preferred flowers of Bumblebees. 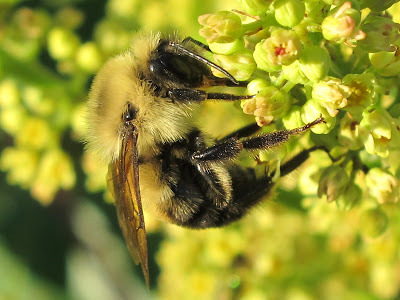 I always find an abundance of Bumblebees on these blooms. 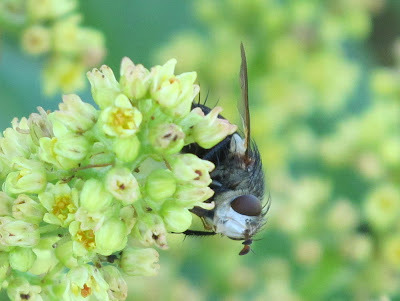 I like to watch flowers because of the wide assortment of insects that they attract. When they are busy feeding, insects are easy to approach and observe. I’ll be spending a lot of time around the sumacs for the next week or so in hopes of seeing something new and unusual. 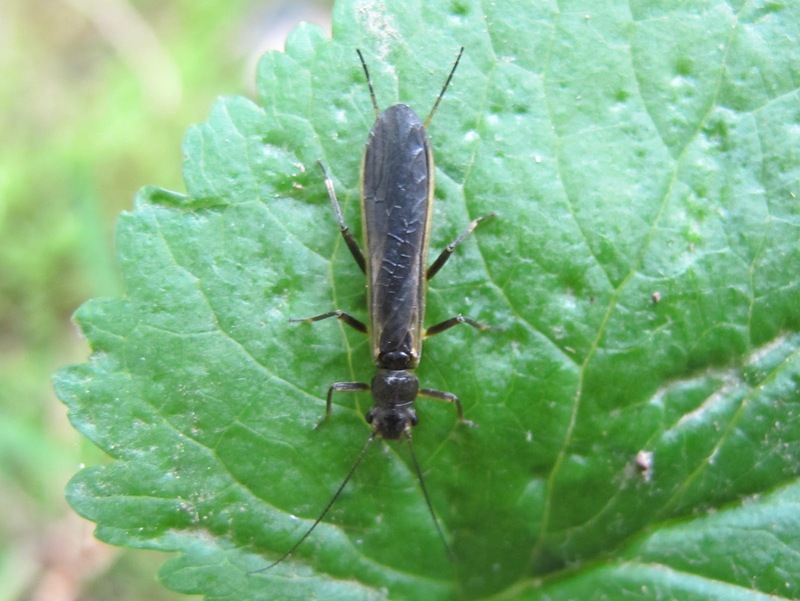 The adult of an aquatic insect sitting on vegetation along the creek is a normal sight for June. Many species are in the process of mating and depositing their eggs into the creek water. Unfortunately, there’s not much of a creek left for stoneflies such as this to use for their egg laying. 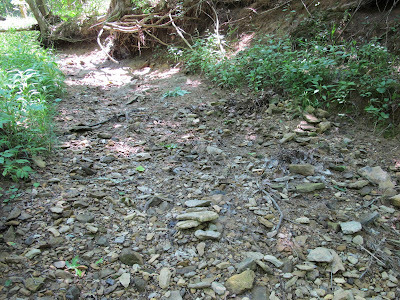 This has been a rough year for creek dependent creatures at Blue Jay Barrens. 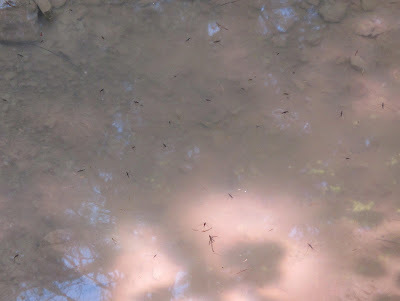 The salamander larvae lost out to the fish and then the fish disappeared with the water. Most of those little fish I posted about last week have now died. 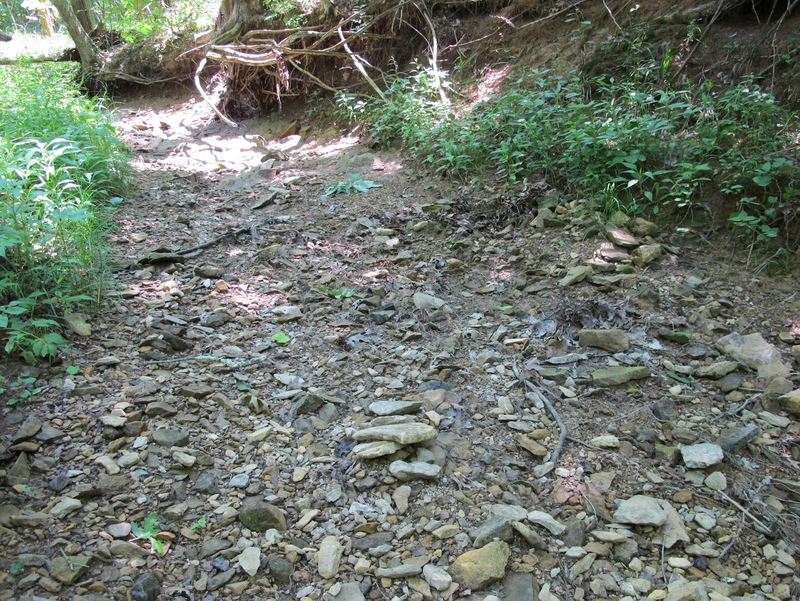 The shallow riffles have turned into dry gravel. The creek has seen some extreme changes over the last six months. 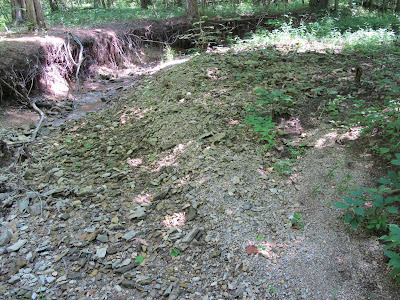 A winter flood deposited most of this gravel. 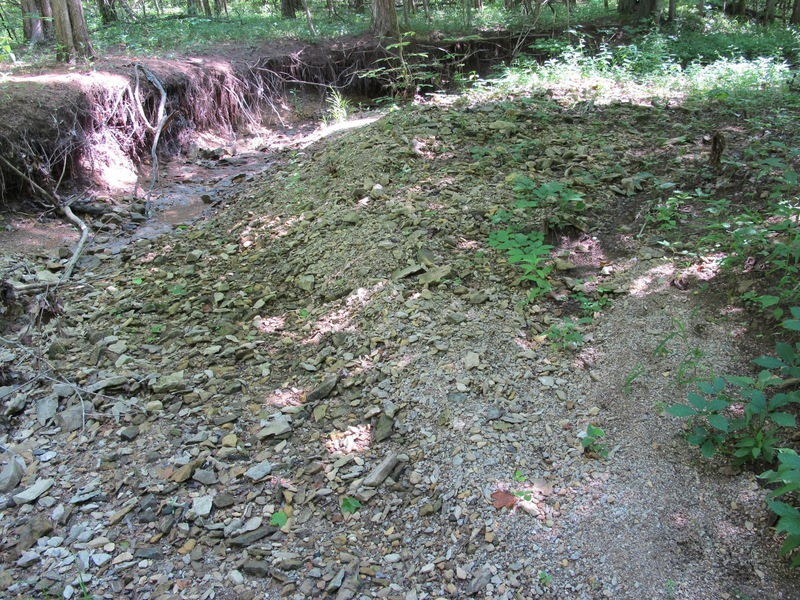 A spring flood overtopped it all and began moving gravel farther downstream. Now there’s no water and everything is drying out. This stretch was running full just three months ago. 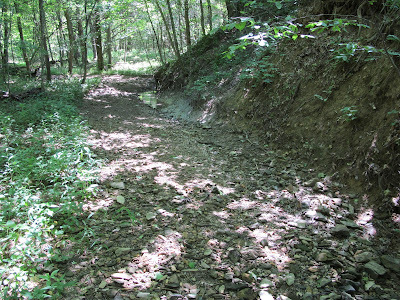 It’s not uncommon for the creek to stop flowing, but that is normally a late summer event. There are about a half dozen of these larger pools surviving. They are already providing water for a wide variety of wildlife and will become more attractive as the drought progresses. A good measure of activity in the pool is the cloudiness of the water from suspended sediment. The water becomes muddier with increasing animal visitations. 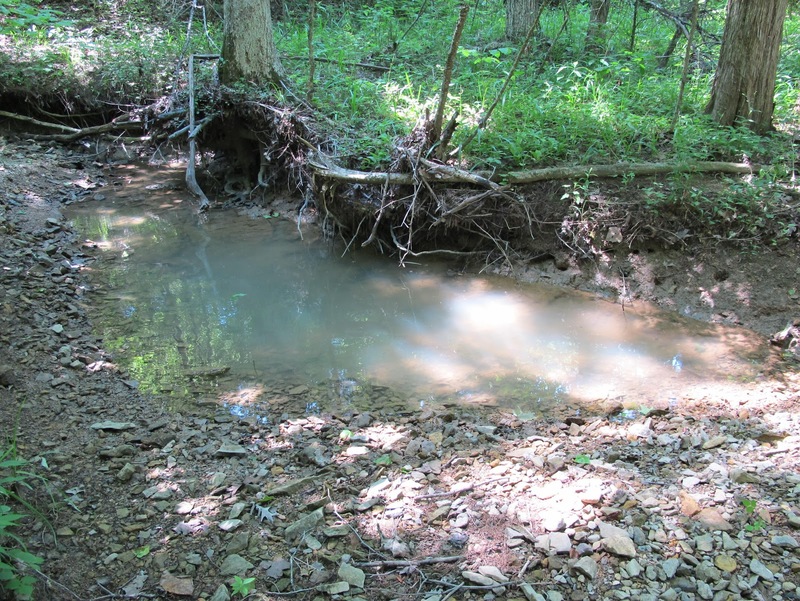 Water Striders have concentrated into the few remaining pools. As they become more crowded, competition for food increases. The Water Striders battle for each small insect that lands on the surface of the water. Without substantial rain, all pools will eventually look like this. 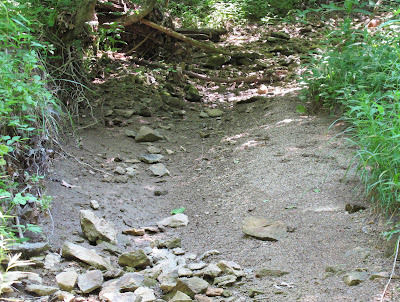 The fact that the creek goes dry each year is not a problem. The problem arises with the timing of that event. Most of the organisms that live in these upper watershed tributaries are adapted to surviving in temporary water bodies. The loss of water eliminates predators that would feed on the young and adults of the animals that breed here. For many, a year of permanent water flow is just as disastrous as a year of early drought. 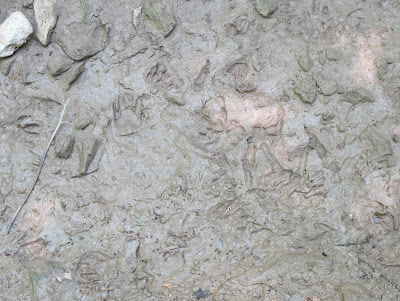 Some animals are capable of leaving the doomed pools and others disappear beneath the stream bed. As the last of the mud begins to dry in a lost pool, animals arrive to capture those creatures incapable of retreating. We’re many months away from the time when drought relief is normally expected. It’s hard to predict what the creek may endure during that time. Blue Jay Barrens is still lacking butterflies. A few species, like this Northern Metalmark, are present in expected numbers, but most species are either poorly represented or completely absent. Northern Metalmarks typically sit with wings outspread, so the common view is of the mostly brown upper surface. Occasionally one will give a glimpse of the bright orange under side. 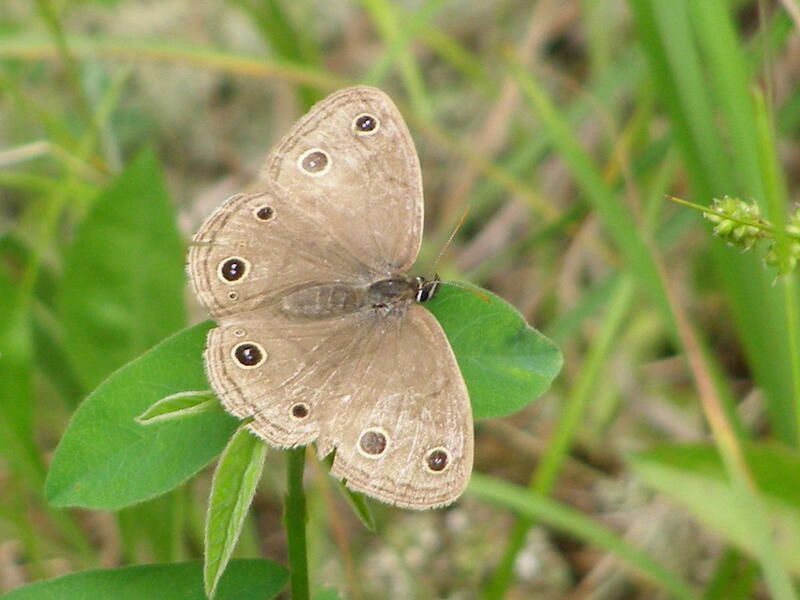 Even though the metalmarks are occasionally found on flowers, their usual location is on a sunny leaf near the ground. My first notice of them is most likely to be when they quickly shift plants at my approach. 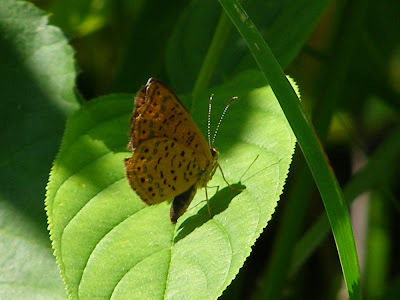 I don’t know why this species would be so abundant this year when so many butterflies are absent. This may look like a typical clump of Butterflyweed, but there is something missing. There are no butterflies visiting here. 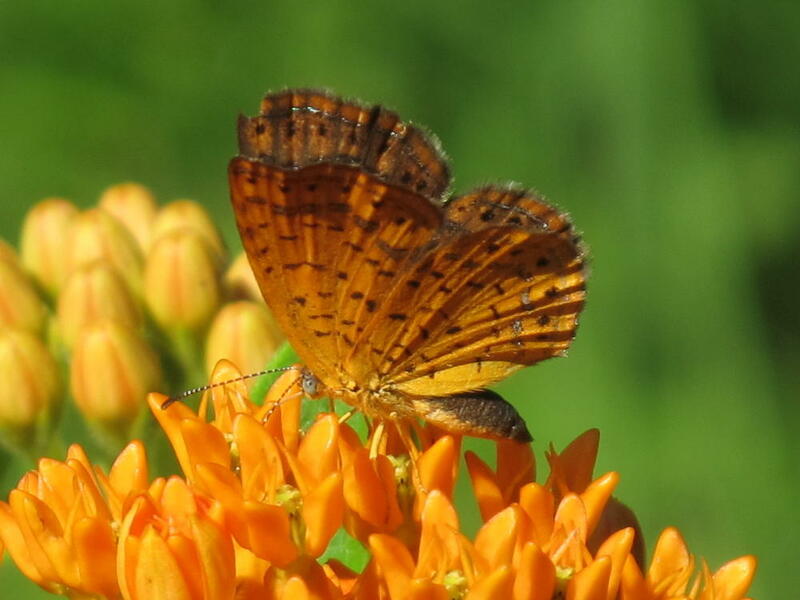 At this time of year there should be no Butterflyweed clumps without butterflies. Most noticeable to me right now is the total absence of any hairstreak species. Common Wood Nymphs are around in good numbers. 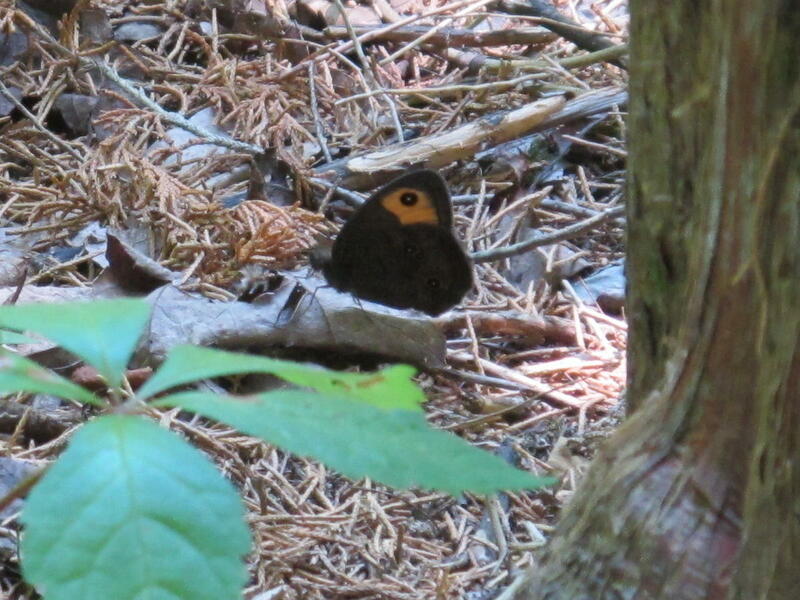 These are low fliers that thread their way through the vegetation. Little Wood Satyrs are generally very common this time of year. I’ve seen only two in the past week. 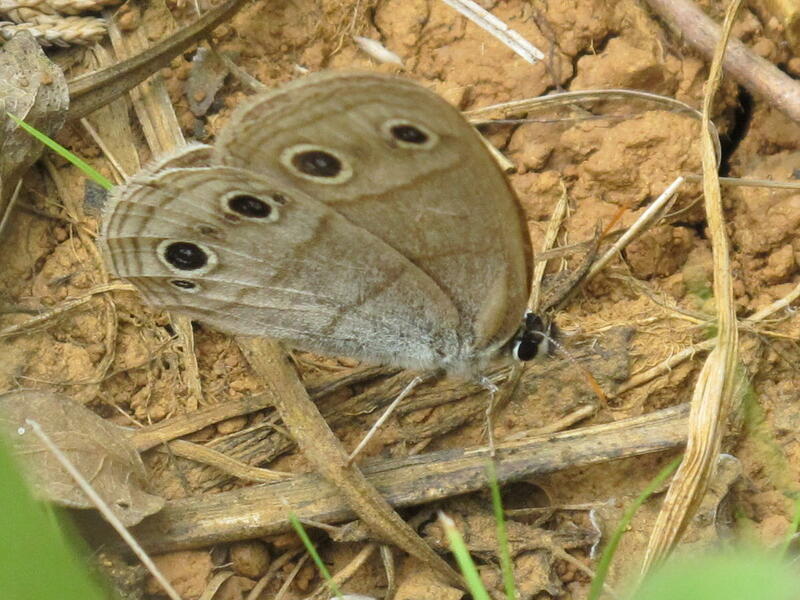 This Little Wood Satyr looks like it’s been around for a while. Hopefully the few individuals that managed to emerge have left plenty of eggs to rebuild the population for next year. 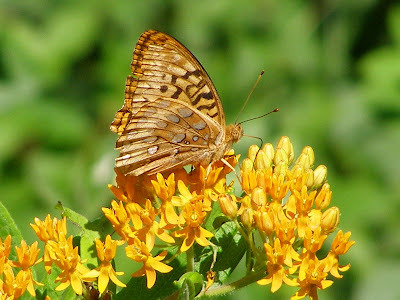 Most of my Great Spangled Fritillary encounters have been with lone individuals. 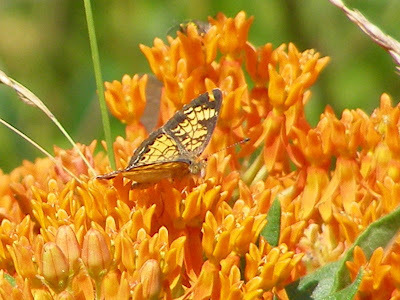 In some years there are so many of these butterflies that they knock each other off the flowers during the scramble for nectar. Just a scattering of Pipevine Swallowtails around. 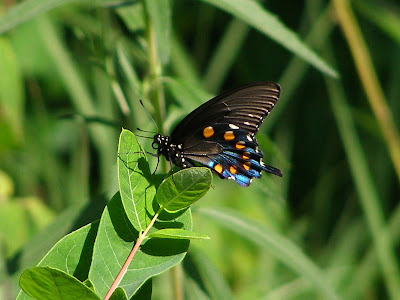 No other swallowtail species were seen last week. 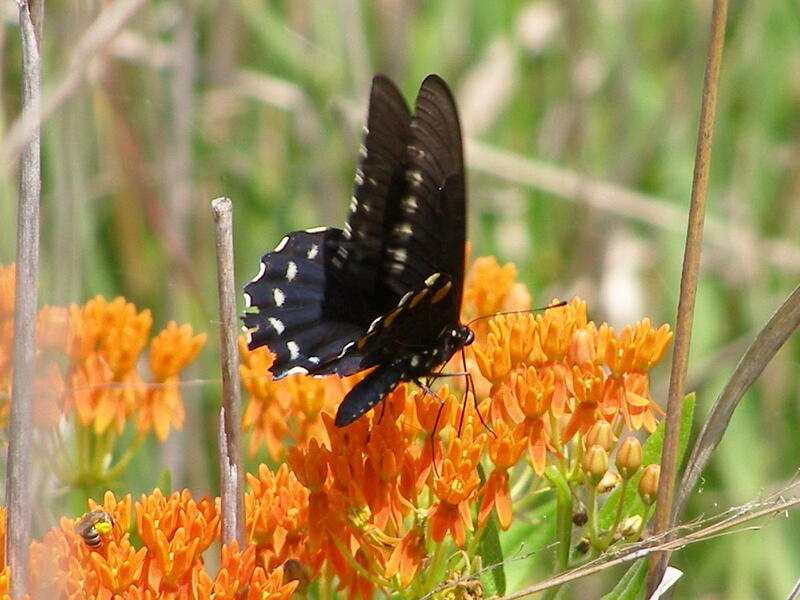 This is one of the swallowtail species that keeps its wings moving while feeding. 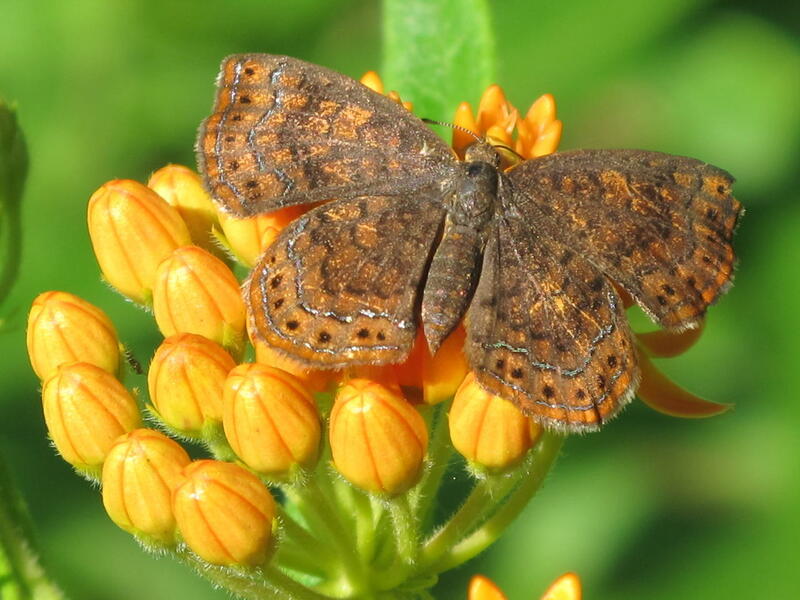 I figure all of that movement makes it more difficult for predators to zero in on the butterfly. It’s disturbing not to see the familiar masses of swallowtails working over the Butterflyweed. A lone Pearl Crescent has the entire flower head to itself. I hope the butterflies get themselves straightened out. I can understand if it was the weather patterns responsible for the decline. The winter was warmer and wetter than normal, spring brought record floods and high temperatures and summer is beginning with a severe drought already underway. This may turn out to be the year without butterflies. 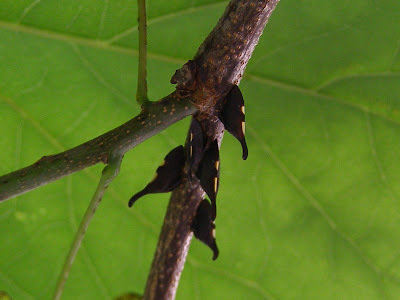 For many years I have enjoyed finding an abundant supply of these Treehoppers on the Blue Jay Barrens Redbud trees. When I was young, finding Treehoppers was a real treat. Being experts at looking like a part of the plant upon which they are resting, they never quite looked to me like real animals. If they chose to move, it looked like the plant was rearranging its parts. 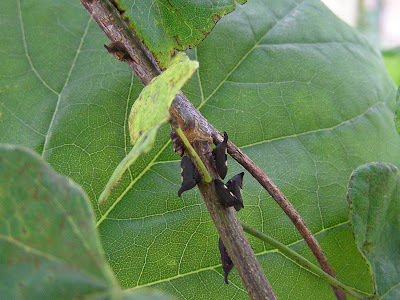 Most have the general shape of thorns and make a normally smooth stem appear untouchable. 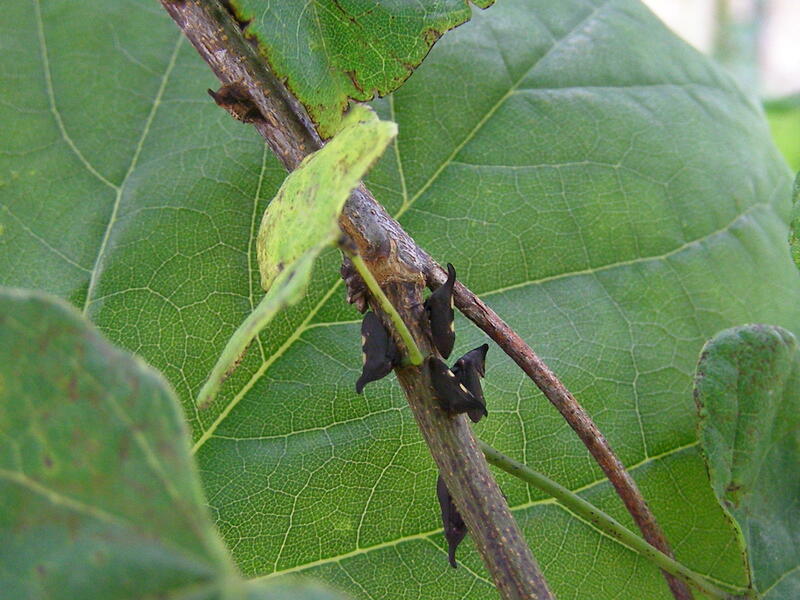 Knowing that the plant doesn’t produce thorns is what tips most people off to the presence of Treehoppers. Redbuds have smooth stems, so the thorns can’t be real. 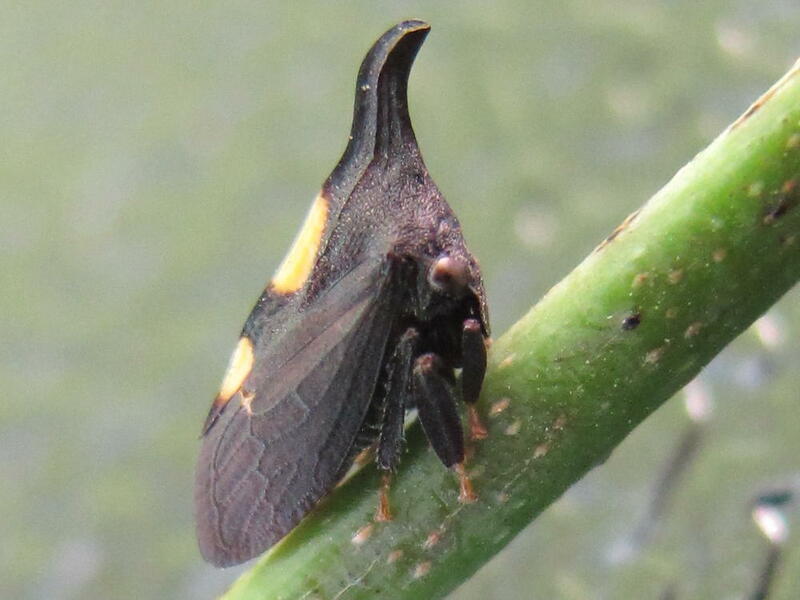 Treehoppers pierce the stem with their mouth parts and feed on the sap. Since their food comes to them, they don’t have to move around and they benefit by being mistaken for a stationary plant part. Their numbers vary from tree to tree, but I’ve never seen so many as to cause damage to the tree. 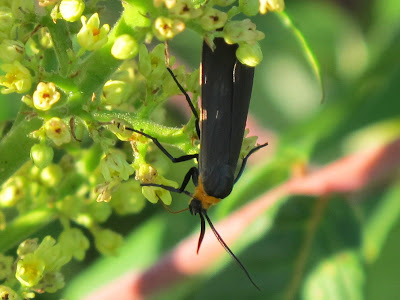 A couple of years ago I decided to learn the name of this interesting insect. 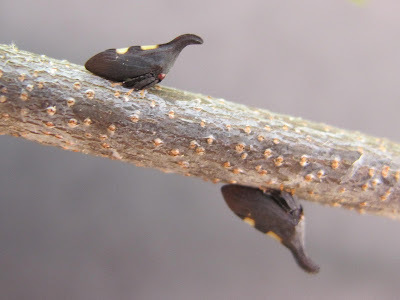 I soon found it referred to as the Two-marked Treehopper, Enchenopa binotata. Further reading indicated that the scientific name actually referred to a complex of species. That didn’t make any sense to me. It’s either a species or its not. After more research, I gathered that there were several similarly appearing Treehoppers that were being assigned as different species because they were dependant upon different host plants. This and several others had not yet been formally described and named. 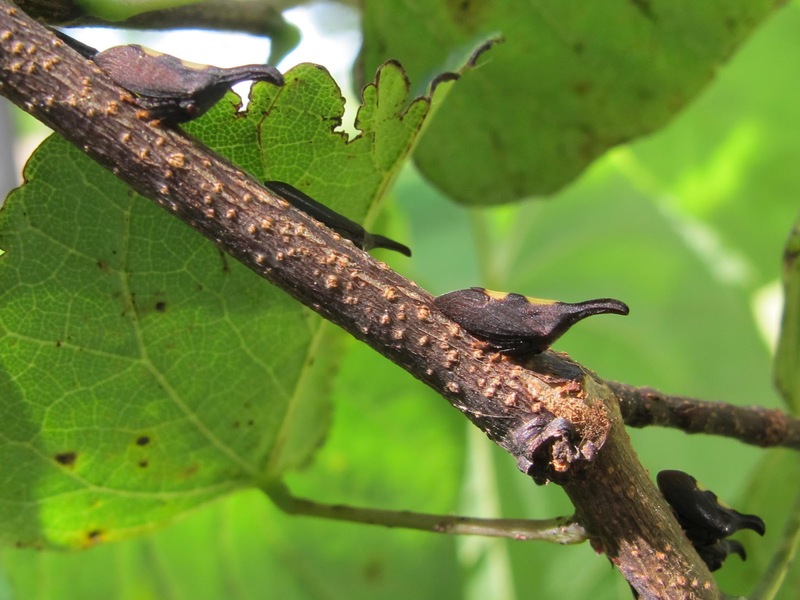 So there’s no new name for me to learn and I can just keep referring to them as the Redbud Treehoppers. Named or not, I find them interesting. I’ve never seen them on any plant other than Redbud, so I must not have any of the other unnamed species. I’ll keep watching them and maybe one day I can go out and announce that they are no longer nameless.